3/4 bed townhouses on exclusive development - Property for sale. Full Description: We are pleased to offer this private, gated development of just 37 exclusive townhouses in the popular village of Boliqueime. Just 900 metres from the church and the centre of the village with all amenities and with easy access to both the motorway and the EN125 this is an excellent location for a family home. 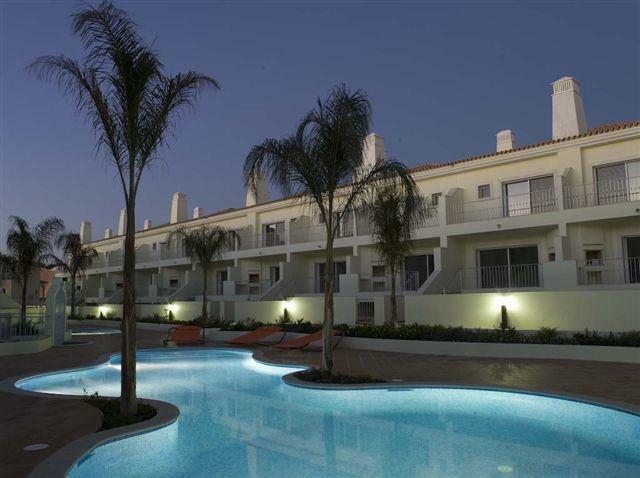 Just a 10 minutes drive to the main resort of Albufeira and the same distance to the golf courses and Marina of Vilamoura this development would be a good choice for a holiday home too. Boasting solid, traditional Portuguese construction these houses have been built to a very high standard producing a contemporary Mediterranean style, coupled with unrivalled comfort and practical finishes. All houses offer spacious accommodation with 136 square metres of internal space and balconies/terraces off all levels. The layout comprises on the ground floor a fully fitted and equipped kitchen, guest w/c, storage, lounge/dining room with woodburner, doors to a spacious sun terrace with built in bbq and steps to the pool and gardens. There is an option to have the kitchen open plan to the lounge/dining room or closed in and completely separate. On the first floor are 2 double en-suite bedrooms with fitted wardrobes and doors to private terraces, there is also more storage. In the basement or courtyard level there is one large bedroom with double patio doors to the courtyard with direct access to the pool and gardens, there is a room prepared for a bathroom, understairs storage and a choice of either a garage or another room suitable for a 4th bedroom. Outside the communal gardens and swimming pools provide a safe and secure environment for children in a family friendly setting. There is so much potential with these houses they really must be seen and with numerous extras they represent outstanding value for money. Viewing is highly recommended.